We do know that some of our older specimens were hunted from the wild, common practice at the time, as we can see the indiscriminate damage done by the hunter’s bullets. Many of these hunts would have been commissioned by collectors aiming to fill gaps but others were carried out by enthusiastic hobbyists. There are contemporaneous accounts of these expeditions where the bored and wealthy would pay well for the “sport”, the results of which would often find their way into museums. 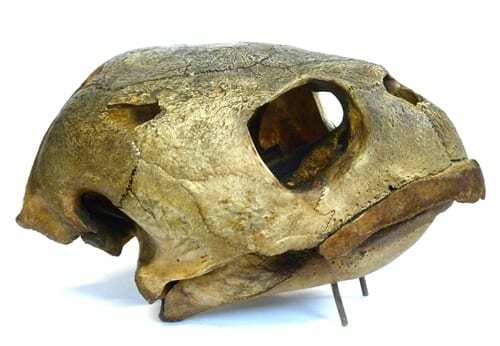 LDUCZ-X11 loggerhead turtle skull. Note the bullet hole at the back of the head. Not every damaged skull was “hunted” however. 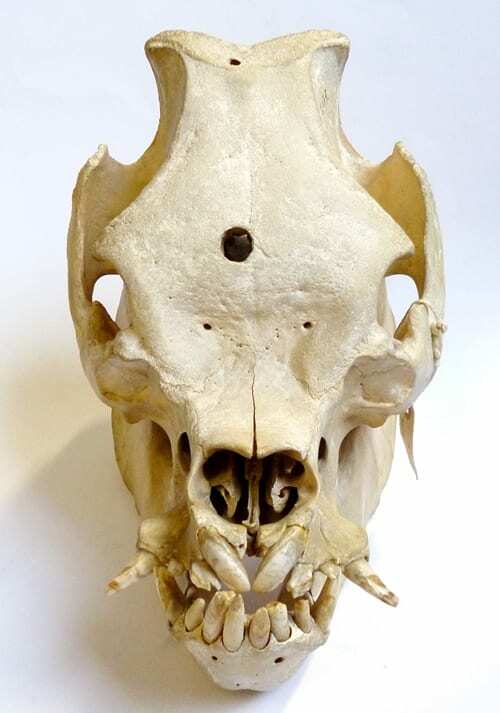 Visitors often notice the almost perfectly spherical holes on the top of some, particularly prevalent in domestic species (pigs, horses, sheep etc.) and animals that came to us from zoos. The “humane killer”, or bolt gun, has been used by generations of vets and slaughter houses. When used correctly it is placed in close proximity to the animal’s forehead and then fired. The single bolt is driven into the brain, through the brain case, apparently causing immediate unconsciousness and the characteristically neat hole in the skull. LDUCZ-Z173 domestic pig skull. Note the perfectly spherical bolt hole on the forehead. Smaller specimens would, of course, be obliterated by a bolt or a bullet. In these cases collectors would have used a variety of methods that would cause the animal to die without obvious damage. Hard-bodied insects, for example, would have been placed in a sealed, glass chamber colloquially known as a “killing jar”. The killing jar would then have been filled with ether, chloroform or another lethal gas. And the specimen, once dead, could then be pinned. This technique was not considered effective for soft-bodied insects like caterpillars. Instead these would have been placed directly in a preserving fluid and “fixed”. Small reptiles, birds and mammals, unless domestic, would probably have been killed during their capture. As Vernon Bailey puts it in his 1921 article, Capturing Small Mammals for Study: “If you wish specimens, set any of the half dozen kinds of snap traps that come down across the necks or backs and kill quickly, selecting the right sizes for the animal you are trapping.” Birds would have been trapped with strung nets or shot using firearms containing very fine, “dust shot” to avoid unsightly bullet holes. If captured alive, however, the cleanest way to kill the animal before preparation would have been gas. To be crass, there is certainly more than one way to skin a cat. And if my experience of zoologists is anything to go by these text-book answers probably represent a tiny fraction of the techniques that have actually been used. There are 68,000 specimens in the collection and I’m sure each one could tell a different story. I hope I have given an idea of how some of the specimens have ended up on our shelves but I’m sure it is not a complete picture. It would be nice if I could look our visitors in the eye and tell them “everything died of old age”. But they didn’t, so I can’t. But – why did these animals die? Reading the above might make collections like the Grant Museum seem pretty awful. And yet I work here so I can’t really think that. We’ve covered the how, so now let’s look at the why. To start with, it is worth noting that we are still “shooting” things it’s just that after you’ve taken the picture the monkey stays in the tree. 200 years ago this was not an option. There was no David Attenborough to respectfully show us wildlife and then leave it be and so the only way to study and educate ourselves about the natural world was to bring them home. And it is undeniable that these collections did educate us, helping Victorian scientists to revolutionise our understanding of nature and our own place within it. Grant, Darwin, Huxley et al. all used specimens. And the research continues today – a quick google scholar search will show you that. Museum practice today has changed. The Grant Museum is still classified as a growing collection, but we’re growing very slowly: maybe one or two objects a year. And then only if it fills a taxonomic gap or will have a particular use in teaching or public engagement. We know where everything comes from, usually zoos or other historic collections, and collecting for collectings sake is, for us, a thing of the past. In fact the last field-collected specimens we acquired, our hutias, were found dead. Lethal collecting does still occur occasionally in the museum community, particularly as an element of taxonomic study. It is not my place to comment on an individual case. What I would say is that modern scientists work to strict ethical codes, having to justify every stage of their research to funding bodies and the wider academic community. I can totally understand that to some people the idea of killing an animal to study it can never be justifiable. Others see it as the only realistic way to answer the questions we would all like answered. 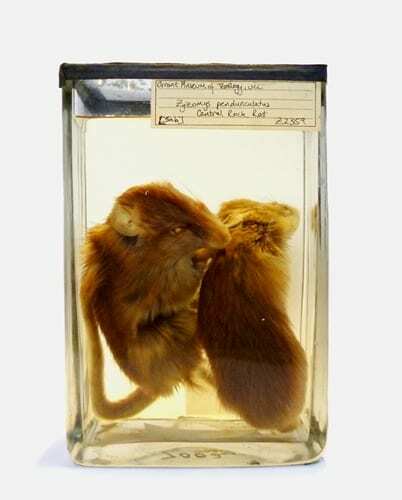 Millions of people visit natural history collections every year in the UK alone. This must be indicative of huge engagement with their work so I am sure that this discussion is not over.